We at streets.mn have been fairly critical of the excess of traffic control devices on the Washington Avenue traffic mall . We have questioned the purpose of all the lights, including mid-block walk signals, when there is no motorized cross-traffic. The response from users of the traffic mall has been a great many violations of the law, students (and dare I say faculty and administrators) crossing against the light after using their own eyes to check to see if it is safe. This, of course, breeds genuine contempt for traffic control devices and contempt for government competence in general. Don’t Walk: Washington Avenue at Union Street, just west of the East Bank station. A pedestrian signal telling me not to walk in the landscaped median area from east to west. We ask: why would the University and City do this? Don’t they know how ridiculous all these signals are? We prepare students to meet the great challenges facing our state, our nation, and our world. As a U of M student you’ll engage with your professors and fellow students from the very beginning. And you’ll develop your strengths with beyond-the-classroom experiences. In a Hogwartsian, beyond-the-classroom, fashion, we have put students in a situation where they do have to rely on their own eyes, not officious light bulbs, to decide when to cross the street, if they don’t want to waste minutes per day (and hours per year). 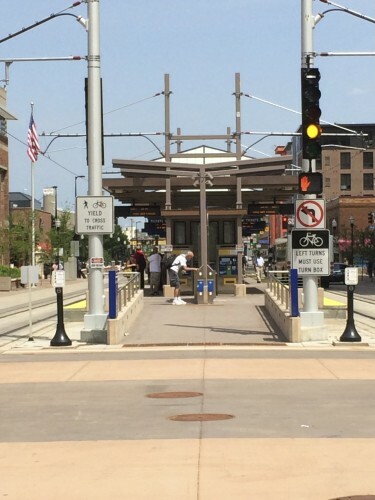 In a devious plot, the University and City of Minneapolis have succeeded. Students now do think for themselves since relying on authorities to think for them is so wasteful.